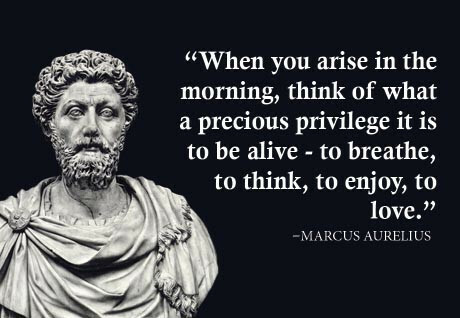 April 20 is the birthday of the famous Stoic, Marcus Aurelius. In honor of him, today we hear from NaturalPantheist on the philosophy of Stoicism. This essay was originally published at the Nature is Sacred blog. Stoicism is an ancient Greek philosophy, developed by Zeno of Citium in Athens in the 3rd century BC and came from the ideas of Cynicism. It was further developed later by Roman philosophers including Epictetus and Seneca. 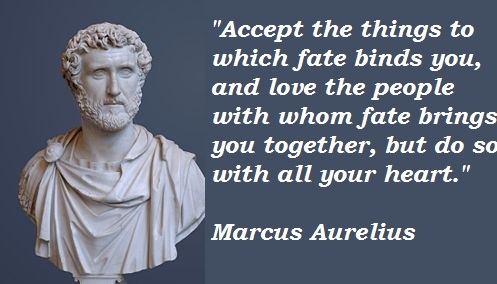 The famous emporer Marcus Aurelius was a Stoic and many of the insights in his book Meditations reflect Stoicism. Like Epicureanism, Stoicism suffers a bad name and conjures images in people’s minds that do not accurately reflect the philosophy. Stoicism is often seen as advocating a pleasure-less and uncaring life, but, as author William Irvine points out, Stoicism can lead to a life of great joy. 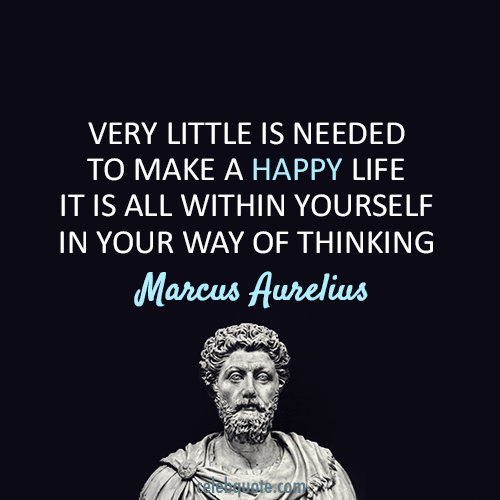 The aim of Stoicism, just like Epicureanism, was to help one lead a tranquil, virtuous and happy life. Stoicism begins with a particular world-view – a Pantheistic one. To them the universe was god and it was rational. Not only that, but everything in the world was inter-related, a vast complex web of relationships. Like Taoism, the world was maintained by the natural interchange of opposites. And not only did they see the universe as rational, but humans were rational too. They said that people should seek to “live according to nature.” By this they meant not only that we should live according to nature, but also our inner nature – our reason and rationality. To the Stoics, true freedom came from understanding the order of the universe and acting in accordance with it. If we do this, if we keep clear, aware, mindful and attentive minds then we will be able to act rationally and in harmony with the universe, which will enable us to live a virtuous life. The Stoics taught that the ideas of good and evil were man made concepts. While things that happened to us could be seen as negative or positive, they could not be seen as good or evil. We are the ones who give things values. What could be considered good or evil was inside of us – our intentions, our attitude and priorities. In this way, the Stoics emphasised the vital importance of human character and cultivating the virtues of wisdom, justice, courage and self control. Like Buddhism, the Stoic philosophers observed that everything in life was impermanent and subject to change. Everything in our lives change, we change, the world changes and for that reason it is silly to get too attached to anything. Nature is ultimate control and can give and take as it wishes. All things, both negative and positive, are from Nature and we should be accepting and grateful. The Stoics were fatalistic and taught that because the universe was rational and “god”, we could trust it. We therefore should accept that what happens to us is what should happen or is part of a plan. We should accept misfortune peacefully as we cannot do anything about what has already happened. Nature rules and we should accept our lot without complaint. In the grand schemes of the universe our concerns and events don’t really matter and we are insignificant. There is no free will because ultimately everything is based on a cause and effect relationship in the universe – everything is interrelated to everything else and what happens to us is caused by a wide web of other things leading to that circumstance. Many modern people do not like the idea of fate, but having a fatalistic attitude about the past and the present can help us greatly to get over the past and accept life in the present. We can accept that there is nothing we can do about the past, and similarly we cannot do anything about what is occuring right at this moment because its based on what has come previously. Yes we can learn from the past but dwelling on it will do us no good. What about the future? I think there is a way to and adopt a fatalistic approach to the future if it is related to outcomes. We obviously can have influence on what happens in the future to a small extent, but the fact is that ultimately outcomes are not in our control. Rather than having lots of expectations about the future, or wanting a particular outcome, we can instead accept that while we can have some influence, the ultimate outcome in any situation and what happens to us will ultimately not be in our control. This brings me nicely onto the key insight of Stoicism – Control. The greatest contribution of Stoicism to the world is their theories about control – what is in our control and what isn’t. To the stoics there are very few things that are truly within our control, but there is a lot outside of our control. Because few of us understand this, we suffer. However, when we learn about what is truly within our control and stop trying to control what isn’t, we can live a peaceful, tranquil, content and enjoyable life. So what did they think was in our control? The answer is little! To the Stoic you cannot control the world around you – your relationships, health, wealth, social status, other people, the weather, traffic, outcomes, events and circumstances. The only things we can truly control are within us – our character, our motives, our thoughts, our expectations, our goals, our values. We may be able to influence some things outside us, but ultimately we cannot control anything outside us. We cannot control their final outcomes. For example – we might eat right and not smoke in the hope we live forever, but accidentally get sneezed on by the wrong person while walking down the street and we will get that cold. We may try to take a short-cut to get to work tomorrow morning, but if enough others do the same then we will still end up stuck in a queue. Suffering, negative emotions and disturbances to our mental peace do not come from events in themselves, but rather from our responses to the circumstances of our life. We have false beliefs and opinions, and make faulty judgements about the nature of reality and our place in it e.g. what we should be able to control. This leads to unhappiness. The truth is that we cannot control what is outside of us, only what is inside. We cannot control if someone does something to annoy us, but we can control our reaction to it – or at least we can train ourselves to have a better reaction to it, through training ourselves to be aware and mindful before we react. If we pursue things outside ourselves for happiness or get attached to certain outcomes e.g. getting the best grades, buying the latest computer game or car, our kids keeping their bedroom tidy, then we are going to end up disappointed and unhappy when things don’t go the way we want. We should be indifferent towards everything outside our control. Does that mean we have to be indifferent to friends and family I hear you ask? Well technically yes. However, that doesn’t mean we shouldn’t care for them. We just need to remember each time we are with them, that ultimately what happens to them is not in our control and one day we will have to say goodbye. We should enjoy them while we can, but not get so attached that we think they will be there forever. Happiness and tranquillity comes from not desiring things that are outside our control, but instead living in the present and enjoying the moment. We should seek to do our best in all things, but ultimately accept that the great web of nature, cause and effect, will decide the final outcome of everything. We must be content to focus only on what is in our control and accept that we cannot change or control everything. We must invest our hopes not in outcomes but in personal excellence. We must reduce our desires and attachments, stop trying to control the world around us and instead seek to cultivate our inner character. The Stoics also talked a lot about materialism, wealth and fame. They taught that wealth, power, fame and reputation were all external things that we should be indifferent to and counselled not to pursue these things. Although it was ok to have wealth or power, stoics should remain detached from them. They said that we should seek to live simply, plainly and moderately, having few desires and being content. Instead we should pursue those things that really matter in life – tranquillity, peace, virtue and freedom from anxiety and negative emotions. Striving for power, fame and wealth leads to dissatisfaction and the more you get, the more you want. While we do have some true needs, we have many false wants and we must learn to recognise these. The Stoics pointed out that unless you have the right character and wisdom, extra wealth will do you know good – witness what happens to many who win millions on a lottery – most of it is gone within a year as they spend it on parties or drink themselves to an early grave. Instead of pursuing wealth we should realise that everything we have is on loan to us from the universe, it will be taken from us one day, and therefore we should not to cling to wealth, but simply want what is easiest to obtain – what we already have. We should also withdraw from the social hierarchy and power game, not worrying what others think about us, but focused on being the best person we can be. Stoicism has lots to teach us as Naturalistic Pantheists . It teaches us to pursue tranquillity, contentment and peace rather than fame, wealth or power. It teaches us to live mindfully so we can understand what is and is not within our control and react appropriately in our lives. It can teach us about how to accept the circumstances we find in our lives and rather than placing our hopes in future outcomes, to instead focus on developing our character and being the best people we can be in life. And its practices – negative visualisation (contemplating bad things that might happen to you), periodic self denial (to help us appreciate things more), mindfulness (to realise whether we have control over something in a situation), remembering all things change (so we enjoy situations more) and daily journalling (asking what went well/ badly today and how we can improve ourselves) are all valuable things for Naturalistic Pantheists to do. 1) Find a quiet place to meditate and focus on your breath for a few minutes. 2) Contemplate the vastness of the universe and your place in it. Imagine yourself slowly rising above your body all the way out into space. 3) Think about that fact that you might meet people who are irritating, unfriendly or aggressive today and realise it has afflicted them due to their ignorance. They are interconnected to you and we are all really one therefore we should love them. 4) Compassion meditation. Imagine a light around you of love, slowly extend it out to people close to you, acquaintances, enemies and eventually all mankind. I like the Buddhist suggestion of saying “may you be happy, may you be peaceful, may you be loved” as you visualise each group of people. 6) Plan the day ahead and accept that these things will only happen fate permitting. 7) Imagine possible setbacks and how you’ll deal with them virtuously. 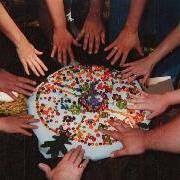 NaturalPantheist: A former Christian, I now see myself as a Naturalistic Pantheist with an interest in Druidry. I blog at Natural Pantheist Musings on issues relating to scientific and naturalistic approaches to spirituality. I’ve lived in both China and the UK and I love to travel. 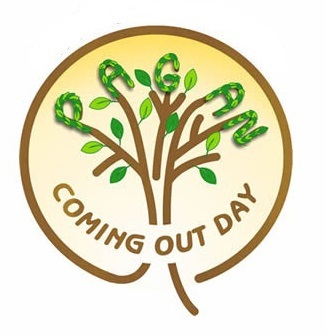 I’m a country boy at heart but also strongly believe in getting involved in my local community here in Devon, UK. My interests include religion & philosophy, social media & technology, current affairs and walking. My blog, Nature is Sacred, is at naturalpantheist.wordpress.com. NaturalPantheist currently serves as the social media coordinator for HP.